It’s been real, pork belly, but your rock star run as protein du jour is drawing to a close. 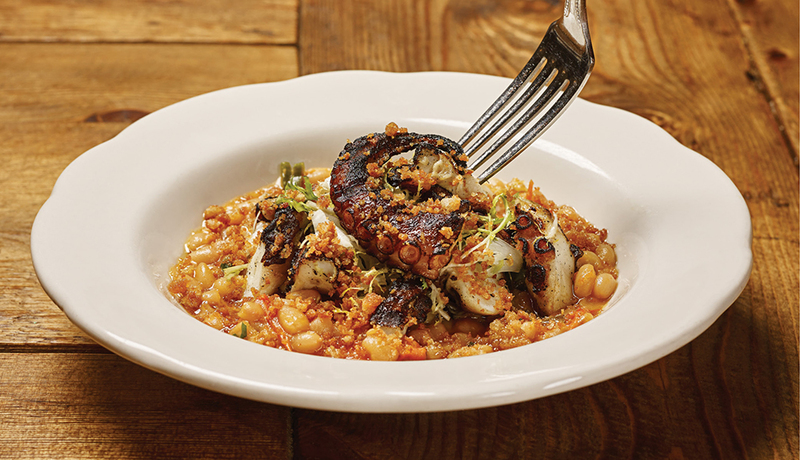 Enter octopus, a meaty and juicy cephalopod prepared with precision at Sotto and popping up on menus around town. Fear not, tepid tentacle tasters. Octopus may carry a mean rep in the ocean, but its firm texture and lack of fishy taste make it the perfect foil for other flavors. Chef de Cuisine Danny Combs serves up choice cuts of grilled octopus (gently dusted with breadcrumbs) over a sea of white bean ragu laced with spicy shishito peppers and frisée, which adds a welcome bitter bite. At $21, it’s the priciest item on the antipasti menu, but it’s hearty enough serve as an entrée when paired with a bruschetta.